When we welcome the new year, it is customary to say, ‘Ringing out the old and ringing in the new year.’ However, in Indian and other Eastern cultures, the bell has a very positive and auspicious role to play in the lives of people. It is therefore never used to signify the end of anything — only for new beginnings and celebration of joyful and festive occasions. When something new begins, the old automatically ends and therefore there is no need to mention the fact, as our wise elders would tell us. Talking of ringing, bells come in sizes ranging from the tiniest silver one used in pujas to the humongous ones like the Tsar Bell in Kremlin, Moscow which is the heaviest bell in the world weighing a whopping 202 tons! It has never been rung though. 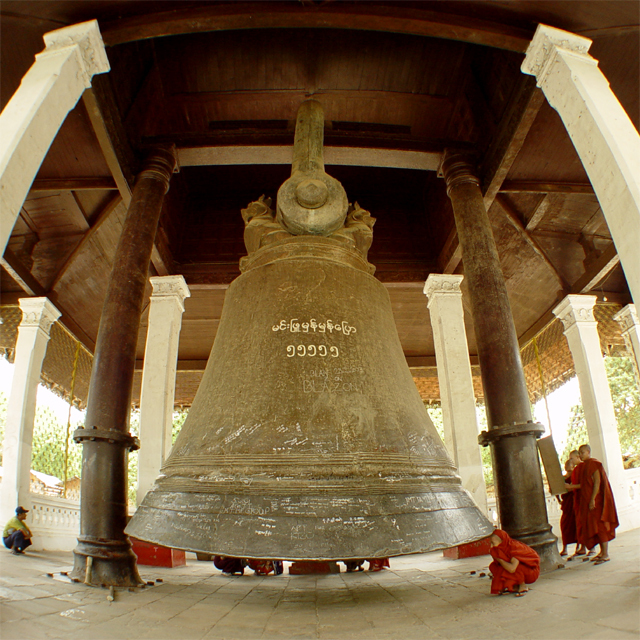 The largest ringing bell was the Mingun Bell in Myanmar, weighing around 90 tons till 2000, when it was replaced by the 116-ton Bell of Good Luck at the Foquan Temple, Henan, China. Whew! Even thinking about their size makes my head reel! The materials used to make these bells are wide ranging too. Some of the large bells have been melted and used to make cannon balls in times of war in Europe and elsewhere too. Sometimes they have been looted as war booty for the precious metals that were used in them. One of the biggest blows the invading armies could inflict was to silence the church bells, which effectively destroyed the warning system of the community and broke their defences. Bells have been an integral part of life in Indian culture for thousands of years and incorporated in our daily lives in many forms. Some homes have a beautifully carved door to the puja room with tiny bells set in them. The tinkling as one brushes against them while passing them is very pleasant. Some people hang small bells in the front door of their homes or shops, to alert them if anyone entered the premises. Some have door bells that sound like a gong! 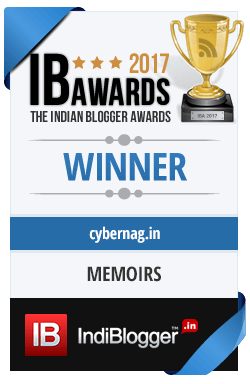 The bullock carts, cows and cattle wear bells which ring merrily as they move. Of course, these are now confined to rural life. Coming to the religious significance of bells, every temple has a bell, small or large – at the entrance. The devotee rings them as he or she enters the premises, to announce their arrival, much as we would knock on someone’s door before entering. This age-old custom is not just a habit, but has deep spiritual and physical effects on our body and mind. For instance, the composition of the metals used in ancient temple bells has a reverberation to the sound of the pranva mantra OM that lasts for about 7 seconds – long enough to touch the seven chakras in our bodies. These are: Mooladhara, Swadhisthana, Manipura, Anahata, Vishuddhi, Ajna, Sahasrara. Life energy flows from the lowest of the chakras (Mooladhara) to the highest (Sahasrara). It is this energy that is released when the bell reverberates to the sound of OM as you ring it. You can read the scientific explanation of the phenomenon here. 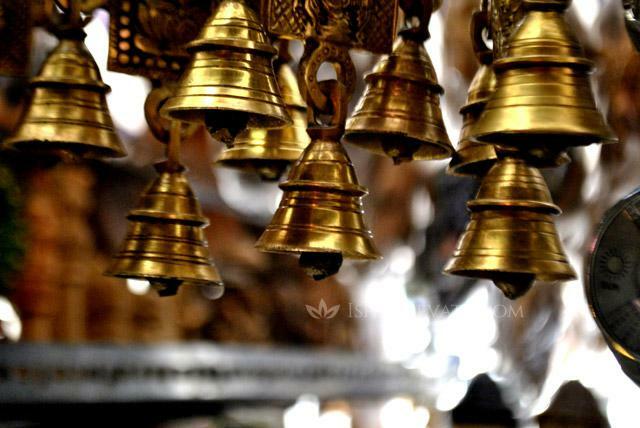 Another important reason for ringing bells in temples and during any festive celebration is that, combined with the chanting of mantras, the sound of the bell drowns out any sounds that bring negativity into the place. The unique bells of the Chidambaram temple called Shikhandi Poornam, produce the sound OM. Close your eyes and listen carefully to feel the power. When the city was still a small town, the sound apparently used to reverberate through the town! I found an audio clip on YouTube of this sound. If Hinduism uses bells for its worship, Buddhism has taken bells to another level altogether. Buddhists believe that the bells signifies wisdom and even the Buddha Himself. 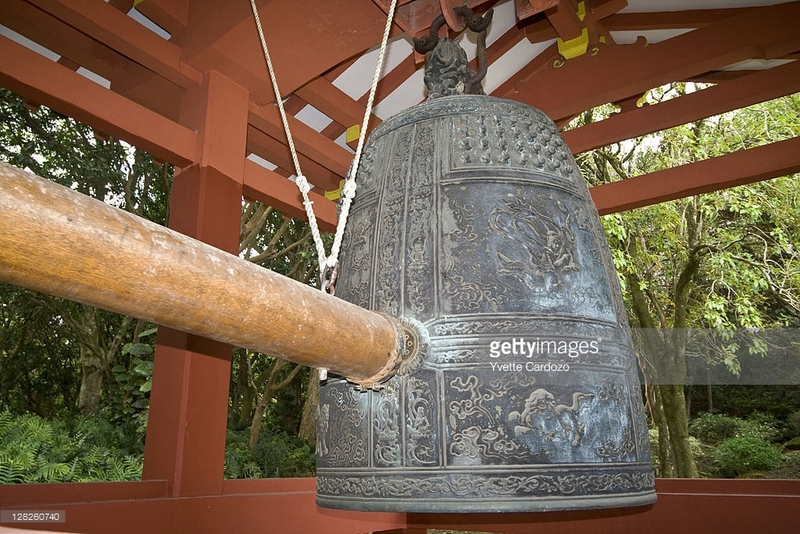 Buddhist temples in Japan have some really large bells called Bonsho. These large bells were/are used to gather the devout for prayers, much as church bells are, since the reverberations travel long distances over mountainous terrain. The unique feature of these bells is that they don’t have a clapper inside, but are struck from outside. 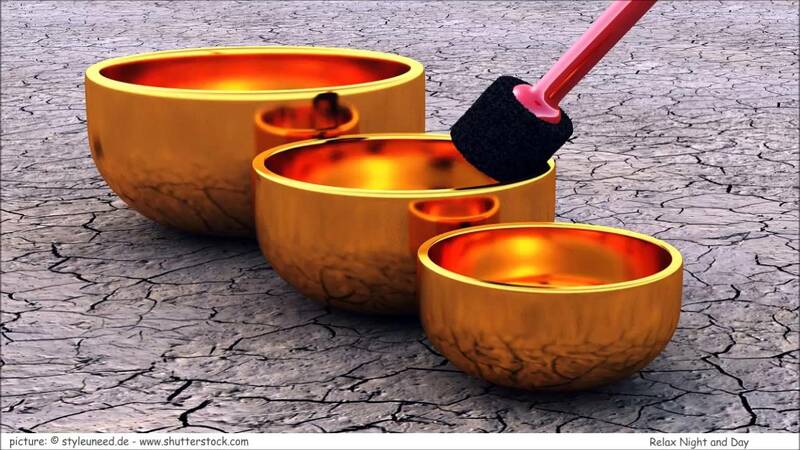 Then there are the Tibetan prayer bowls, which are also called Standing bells as they are placed face upward on a cushioned surface and a wooden mallet is used to run around the rim, producing a pleasant reverberation. These are typically used in meditation and come in sizes ranging from a meter in diameter to a few inches. The smaller ones are held gently in one hand and the wooden stick is rotated around it with the other. Tibetan bells are widely used for therapeutic purposes and relaxation – even for sleeping! The rhythmic ringing of bells is soothing to the nerves and eventually helps calm them. They have worked beautifully for me on many occasions when I was plagued by insomnia. I have a pair of these lovely metallic balls, which the elder son had brought back from Hong Kong. They are held in the palm and rotated deftly. The tinkling sound as the balls touch each other is so beautiful! 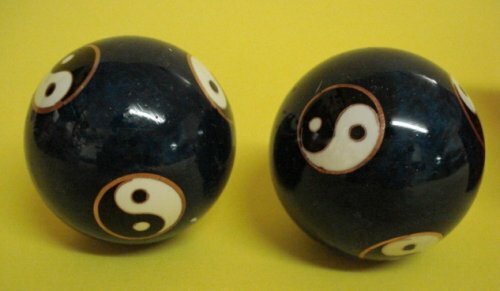 Just now I discovered that they are called Chinese meditation balls or Baoding balls. One of has got slightly chipped when it accidentally fell, but none the worse for the fall as it still tinkles musically! The Chinese were the first to make musical bells with different kinds of chimes. Talking of different kinds of notes, have you heard of a carillon? This is a musical instrument consisting of a set of at least 23 cup-shaped bells arranged in the bell-fry of a church or the top of a municipal building. The musical notes are produced by activating a series of levers manually through a keyboard and a complicated set of wires attached to the strikers in the bells. Wonder how it sounds! Bells play a big role in churches too. I found this interesting article which traces the history of bell-ringing in churches of England down the centuries and how it was once a sport of noblemen! Bells are still used to herald important events in the UK, including at the opening of the 2012 Olympic Games and the Diamond Jubilee celebrations of Queen Elizabeth II. To conclude, at the most basic level, bells are harbingers of joy and celebration. Can any festival or puja be complete without the ringing of bells? Can Santa Claus be imagined without the jingling bells? Can a church wedding be complete without the pealing bells? Can we imagine a temple without bells and their reverberations? Wonder, why the NGT has banned the centuries-old practice of ringing bells and chanting mantras in the Amarnath temple – all in the name of environment protection? Perhaps it hasn’t heard about the effects of ringing bells and chanting on our spiritual and mental well-being — or has it? A very scholarly and informative piece done obviously after lot of research,the hallmark of your writings. The ringing of bells at temples is usually to announce the beginning of puja.As a chit I used to wait for the bell before rushing to receive the sundal! Thank you for your constant support, KP. The use of bells is slightly different in the northern and southern parts of the country. While in the South, devotees are not allowed to touch the deity and do puja or even ring the bell, in the North, the puja can be done by the devotees themselves and temples have bells for us to ring them as we enter.